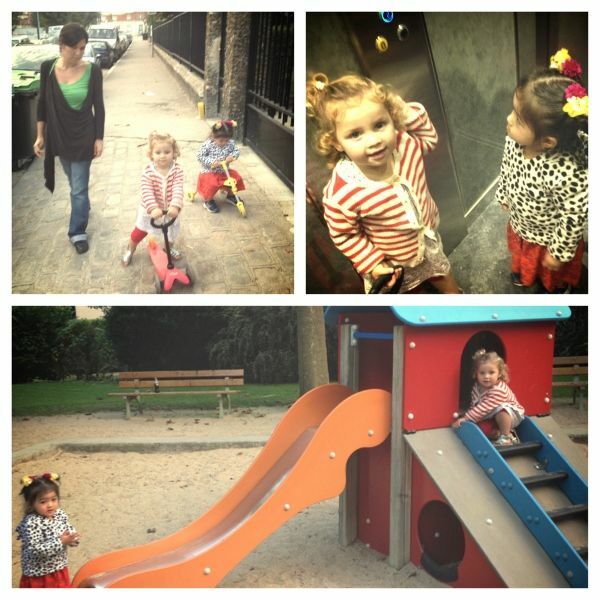 Yesterday evening, Aria and I had a wonderful play date with Ella at my friend Thi-My's. For dessert, Thi-My prepared an apple pear chocolate crumble. The recipe I'm sharing today is a bit different, using home-grown pears, blackberry and chocolate. Thi-My and I have been friends since we were 15. We reminisced about the good old days and stared at our little girls playing with their scooters in the park next door to her apartment. Ella is two-and-a-half years old and she's such a sweetheart. She kept saying "l'autre trottinette est pour ma copine Aria" ("The other scooter is for my bestie Aria"). We melted! 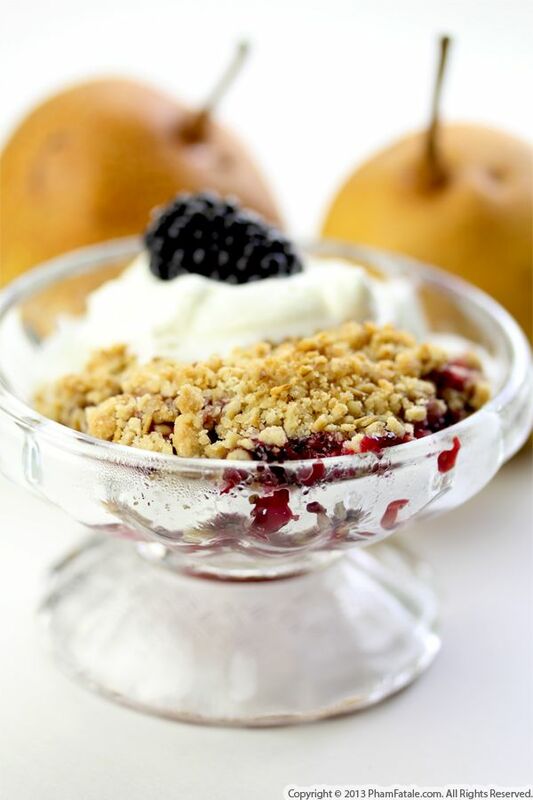 And we melted a second time after eating Thi-my's delicious crumble! Whenever I go a little overboard buying bananas at the market, once the bananas are totally over-ripe, I end up mashing to them for baking. Muffins are a great way to make use of them, and today I made chocolate sour cherry muffins. I used frozen Montmorency cherries, dried cherries and milk chocolate chips. The tartness from the fruit provided a great balance of flavors with the richness from the chocolate. Lya's best friend is having a sleepover tonight, so I prepared these for them. Their plan is to dance othe the XBOX 360 Dance Central game, then watch loads of movies. 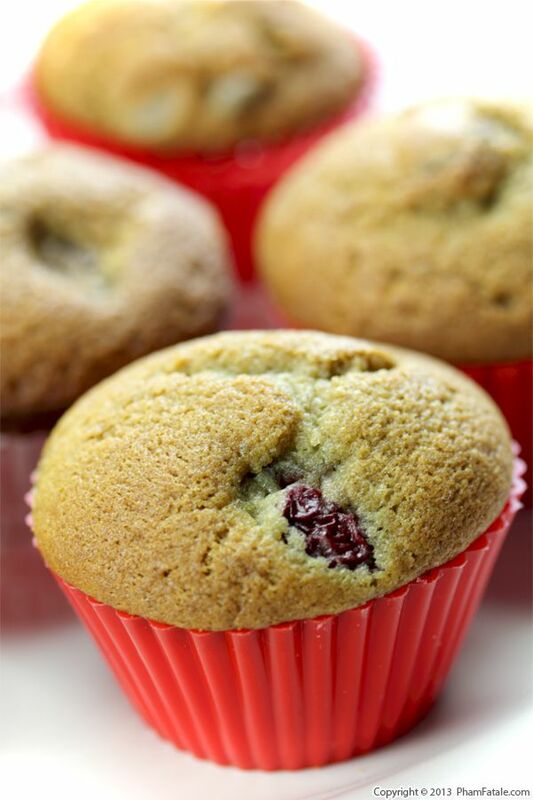 The bffs will definitely get munchies during their fun night, and these cherry muffins are the perfect late night snack! Baby Aria is very similar to my husband Lulu when it comes to her favorite foods. She loves vegetables and she adores sweets. Today I experimented with a batch of cookies I usually make when we have guests over for tea: thumbprint cookies. They're so pretty, especially with the crackle effect on the shortbread cookie dough and the whimsical design in the center indentation that almost resembles a crazy eye. I flavored the cookie dough with cocoa powder and mocha paste. I filled them with vanilla chips and a drizzle of bittersweet chocolate, which came out just as great. Have a wonderful weekend and I look forward to sharing recipes next week in anticipation of Cinco de Mayo! Just like last year, this year my Valentine is out of town for work. I dropped him at the airport on Monday morning, and even though we'll have to wait until the weekend to celebrate, I prepared a special sweet treat for my husband Lulu that he can enjoy during his business trip. I packed a bag of these chocolate puffs in his suitcase, and once he landed, I sent him a message to tell him his favorite chocolate treats were waiting for him. 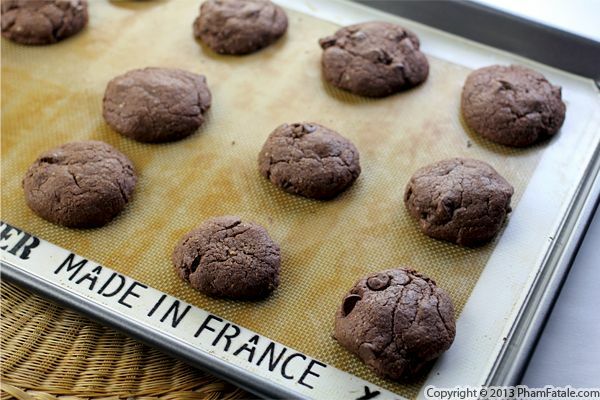 The secret to making these soft, fluffy French cookies is to use finely ground steel cut oats, which was provided by Bob's Red Mill. I met their reps during the Fancy Food Show at their booth in San Francisco. The dough is flavored with cocoa powder and I added chocolate chips to reinforce the chocolate flavor. 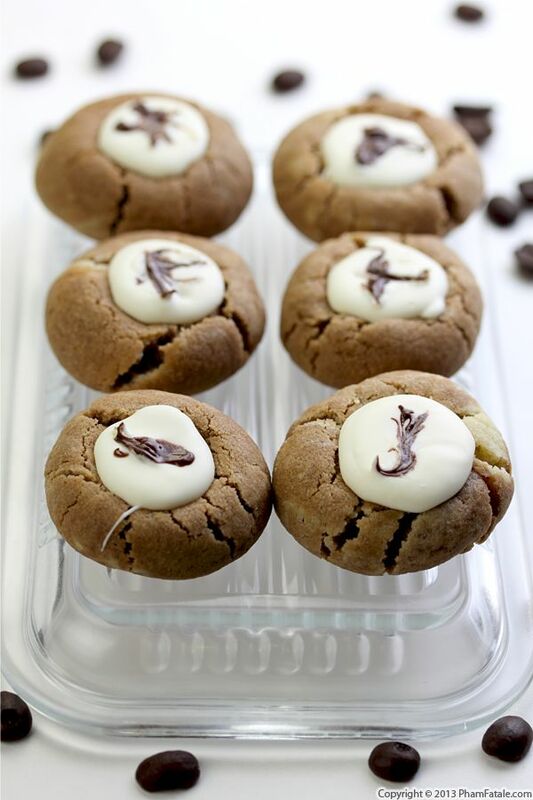 Give this sweet treat to your sweetheart; I guarantee it will be a hit! When done properly, there are few things in life more sensual than chocolate. If your true love happens to love chocolate, you might want to consider it as part of a special romantic dinner this Valentine's Day. This blueberry chocolate mousse would be perfect for someone who is not very confident in the kitchen. 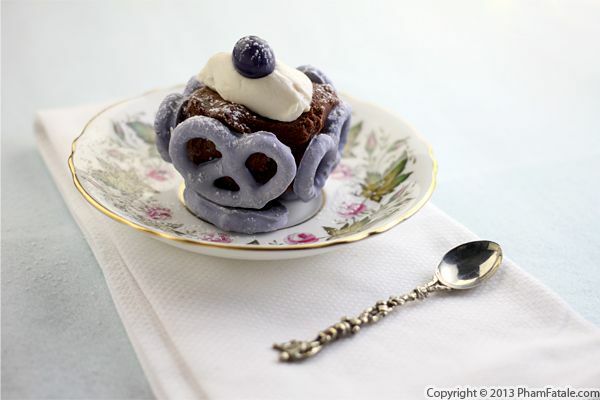 It's made of dark chocolate mousse flavored with fresh blueberries, encased in a cup made of blueberry-yogurt pretzels and topped with chocolate-covered blueberries and yogurt or ice cream. You won't have to spend all day in the kitchen to prepare this dessert, but it will look like you did. Your sweetie will appreciate the gesture! Page 10 of 16 pages.